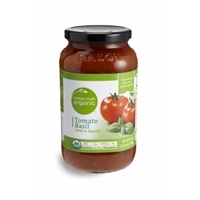 Organic tomato puree (water, organic tomato paste), organic diced tomatoes in juice, organic extra virgin olive oil, organic onions, organic sugar, sea salt, organic garlic, organic basil, organic black pepper, organic oregano. 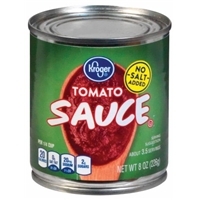 Tomato puree (water, tomato paste), tomatoes, sugar, soybean oil, salt, dried onions, dried garlic, spices, lemon juice concentrate, romano cheese (cultured part-skim milk, salt and enzymes) and basil.contains: milk. Safety button: button pops up when original seal is broken. 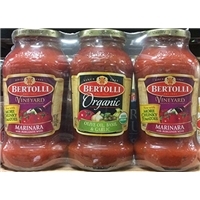 Organic tomato puree, organic tomatoes, organic onions, organic basil, organic extra virgin olive oil, organic sugar, salt, organic garlic powder, organic oregano, organic black pepper, organic fennel. 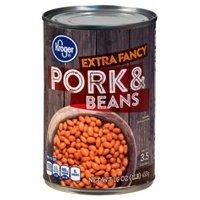 Prepared white beans, water, cane syrup, tomato paste, high fructose corn syrup, salt, vinegar, pork, bicarbonate of soda, onion powder, paprika coloring, spice, natural flavorings. Tomato puree, water, chili peppers, salt, dehydrated onions, dehydrated garlic, and spices. 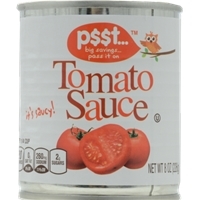 Water, tomato paste, dehydrated onion, dehydrated garlic, spices, citric acid, natural flavor, dehydrated sweet bell pepper. 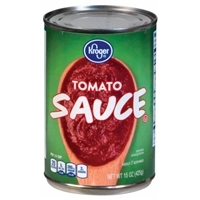 Tomato concentrate (water, tomato paste), salt, onion powder, garlic powder, citric acid, natural flavors, dried bell pepper. 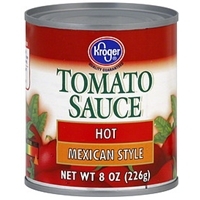 Tomato puree (water, tomato paste), water, less than 2% of: salt, onion powder, garlic powder, citric acid, natural flavors, dehydrated bell pepper. 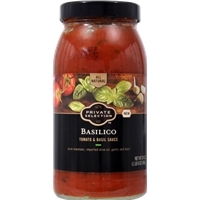 Tomatoes, crushed tomatoes (concentrated crushed tomatoes, water), sugar, salt, basil, olive oil, garlic, pepper, carrots, onion powder, parsley. 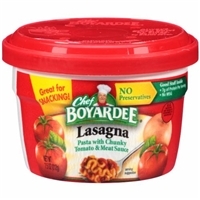 CHEF BOYARDEE® LASAGNA. GREAT FOR SNACKING! NO PRESERVATIVES. GOOD STUFF INSIDE. 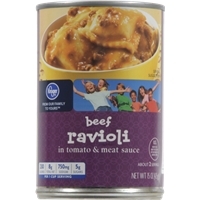 7G OF PROTEIN PER SERVING. NO MSG. U.S. INSPECTED AND PASSED BY DEPARTMENT OF AGRICULTURE. PASTA WITH CHUNKY TOMATO & MEAT SAUCE. 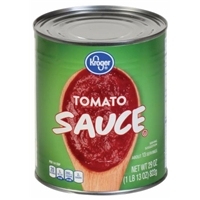 Brand/Manufacturer: Chef Boyardee ConAgra Foods Inc. 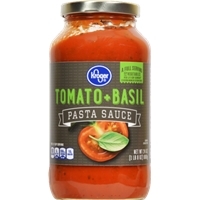 Ingredients: tomatoes (tomato puree, water), water, enriched pasta (semolina wheat flour, glyceryl monostearate, niacin, iron, thiamine mononitrate [vitamin b1], riboflavin [vitamin b2], folic acid), beef, diced tomatoes with juice, high fructose corn syrup, less than 2% of salt, onions, modified corn starch, garlic, romano cheese paste (romano cheese made from cow's : milk [pasteurized milk, cultures, salt, enzymes], water, salt, disodium phosphate), spices. 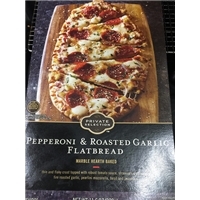 Enriched pasta (wheat flour, niacin, ferrous sulfate, thiamin mononitrate, riboflavin, folic acid), sugar, whey, corn starch, salt, tomato (dried), citric acid, onion (dried), garlic (dried), natural flavor, spices, partially hydrogenated soybean hydrolyzed soy and corn and wheat protein, caramel color, cheddar cheese (dried) (pasteurized milk, cheese cultures, salt, enzymes), maltodextrin, paprika extract (for color), disodium inosinate and disodium guanylate, yellow 5 lake, yellow 6 lake, disodium phosphate and red 40 lake.contains: wheat, milk and soy. Crust (wheat flour, enzyme, water, olive oil, salt, yeast), cheeses (low moisture whole milk mozzarella cheese [pasteurized milk, cheese cultures, salt, enzymes], fresh mozzarella [cultured pasteurized milk, enzymes, salt], parmesan cheese [pasteurized milk, cheese culture, salt, enzymes]), sauce (tomatoes, water, olive oil, salt, spices, garlic powder, citric acid), pepperoni (pork, beef, salt, spices, dextrose, lactic acid starter culture, oleoresin of paprika, flavoring, sodium nitrite, bha, bht, citric acid), roasted garlic, basil. 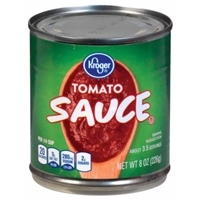 Tomato puree (water, tomato paste), water, enriched wheat flour (flour, malted barley flour, niacin, ferrous sulfate, thiamin mononitrate, riboflavin, folic acid), beef. 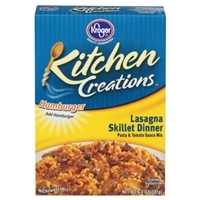 Contains less than 2% of: breadcrumbs (enriched wheat flour [enriched with niacin, ferrous sulfate, thiamin mononitrate, riboflavin, folic acid], dextrose, yeast, partially hydrogenated soybean and/or cottonseed oils, salt), salt, textured vegetable protein (soy flour, caramel color), carrots, high fructose corn syrup, modified corn starch, flavoring, dehydrated onion, citric acid, enzyme modified cheddar cheese (cheddar cheese [pasteurized milk, cheese cultures, salt, enzymes], water, sodium citrate, disodium phosphate, enzymes), caramel color, monosodium glutamate, annatto, sugar, soybean oil, autolyzed yeast extract.contains: soy, milk and wheat.